In Zhejiang province on China’s east coast, people pride themselves on tenacity and ingenuity. Both qualities appear to have driven Heguo Wang to transform the city of Taizhou’s 150,000-cubic-metres-per-day wastewater treatment plant into a new kind of industrial hybrid. Given the importance of developing treatment plants that are carbon neutral, Wang prioritised anaerobic digestion of excess sludge. Such a transformation may be daunting anywhere, but Wang has had to fight extra hard, given the shortage of governmental funds for sludge treatment. So he turned to the private sector, and realised photovoltaic companies had subsidies for solar panels, if they could find enough room to mount them. 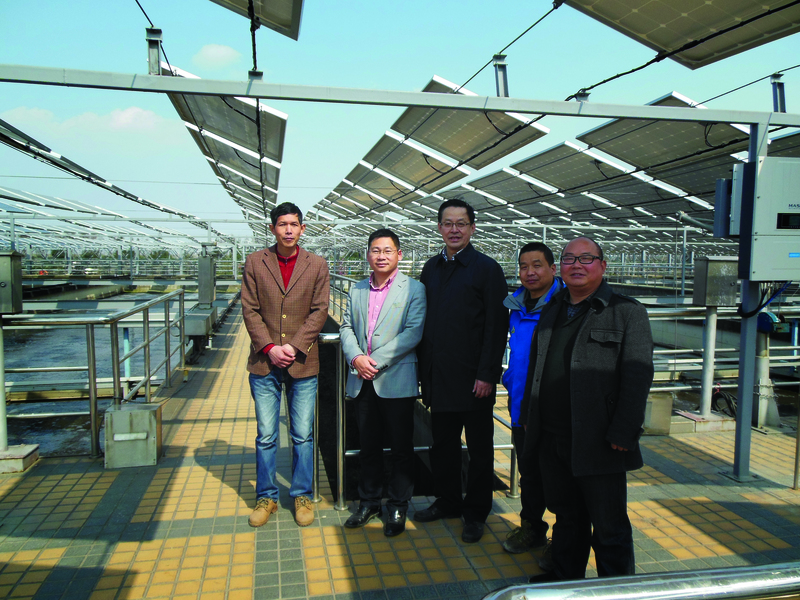 After connecting the dots, Wang’s plant provided new roof space above the aeration and settling tanks, while the company designed, mounted and operated 16,600 panels. The resulting 4.39 MW of new capacity annually offsets 30 percent of energy consumption for the plant. This alone set a precedent, but would it last? The panels had to be mounted in a strong typhoon area where the wind- wave scale can locally reach Grade 17. The partners were inspired by the idea of long-distance power transmission, and after many trials settled on a flexible design tested by a wind tunnel to resist a Grade 12 typhoon. Can it scale? In March 2016, a delegation from Beijing, seeking case studies of carbon neutrality, was pleasantly surprised to find a 5,000 MWh a year plant humming away in this small corner of China, emissions free. The group then saw how three further planned steps–anaerobic digestion, water source heat pumps, and wind energy–would make Wang’s power plant a pragmatic example of how China could generate energy cleanly and efficiently.